Are you ever frustrated when you’re at a restaurant with friends and you can’t hear the conversation around you? Maybe the background music is turned up too loud or maybe there are too many other people in the room, but what if you are suffering from hearing loss? We live in a world full of sound; we have music playing everywhere we go, traffic sounds all the way to work, construction down the street, and the podcasts and songs we listen to with earbuds. All this noise could be slowly contributing to hidden hearing loss, which is classified as “hidden” because it can’t be detected on a normal hearing test. Hidden hearing loss normally doesn’t affect a person’s ability to hear quiet sounds, it just means it’s harder to hear sounds in competing background noise. What causes hidden hearing loss? The brain, rather than the ear, is responsible for detecting sound. The cochlea and all the other parts of the entire ear are designed to convert sound into nerve signals and convey sound information to the brain for interpretation. With normal hearing, sound waves vibrate the ear drum, which moves the tiny bones of the middle ear. These bones carry the sound vibrations to the cochlea. 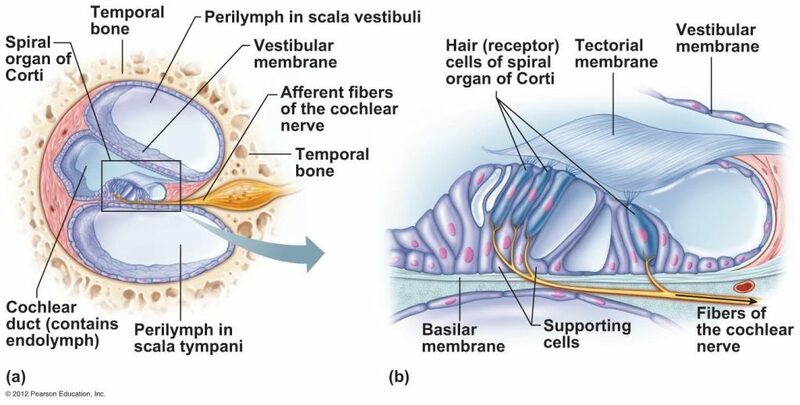 The cochlea pulsates the basilar membrane, which contains thousands of sensory hair cells that move in response to the pressure created by the sound waves. Hair cells inside the cochlea are arranged into rows, one row of inner hair cells detects sound stimuli and three rows of outer hair cells function to enhance and fine tune sound sensitivity within the environment. The cochlea is shaped like a spiral staircase, and the cells at the base of the cochlear spiral, or the bottom of this staircase, respond to high-frequency sounds, while those at the top respond to low-frequency sounds. 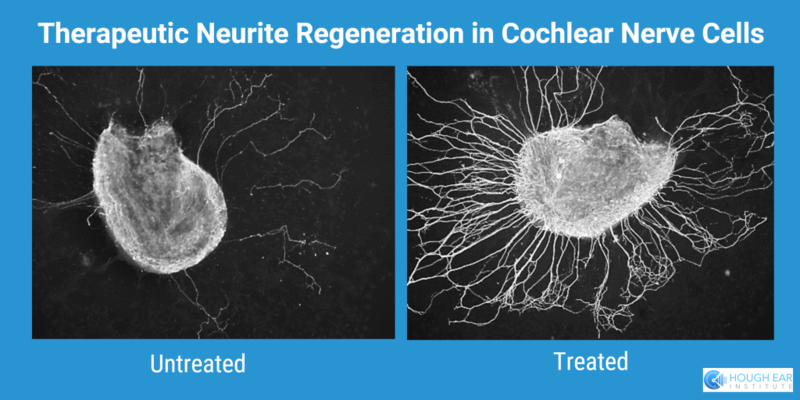 The loss or damage of the neurites that connect the ear to brain are what researchers contribute to hidden hearing loss. When the hair cells and auditory nerve are disconnected, the brain receives less information from the ear, and struggles to interpret the sound information correctly. Hidden hearing loss has remained obscure for so long because audiograms (hearing tests) are administered in a quiet room and don’t activate these auditory nerve fibers, meaning patients can pass a hearing test even when the fibers have been damaged. Sensorineural hearing loss (SNHL) is a term doctors use to refer to irreversible death of hair cells within the cochlea or injury to the auditory nerve. Hazardous and prolonged exposure to loud noise is one of the largest causes of SNHL and hidden hearing loss. To prevent this kind of damage to your ears, make sure you keep the volume down on your headphones, wear ear plugs in noisy environments, and keep the TV volume turned down. Most people have experienced some exposure to the conditions that cause permanent damage to their ear, but modern medicine cannot offer an immediate preventative or regenerative clinical treatment. In our research labs, we have both culture dish and live animal data showing we can regenerate these fine nerve connections and reconnect them to hair cells for hearing restoration. In a clinical setting, this holds the potential to restore hearing function or reverse hidden hearing loss among millions of people whom currently have no viable options for achieving normal hearing. Our pre-clinical results reinforce the promise of this being a cure, but we require further validation for us to move forward with clinical testing. Since there are currently no FDA-approved treatments for hidden hearing loss, our therapeutic approach has the potential to be a first-in-class drug for these indications. Hough Ear Institute is currently partnering with The Hearing Evaluation, Rehabilitation, and Outcomes Laboratory in the Department of Communication Disorders of the College of Allied Health within OU Health Science Center to study hidden hearing loss among college aged students in order to develop a process of testing to help definitively determine if someone has hidden hearing loss. Think you have hidden hearing loss? To take the test, click here. You will be asked to repeat a series of sentences. The exercise begins in quiet, but then slowly introduces background noise.